La Quinta Polo Estates on Madison St. The La Quinta Polo Estates is aptly named…the entry gates are off of Madison Avenue, directly opposite the gorgeous El Dorado Polo Club entry! Jefferson St. is around the corner with it’s shopping center, restaurants and golf shop. 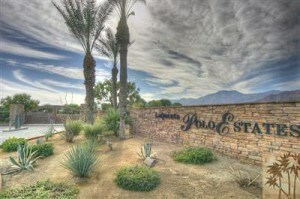 The La Quinta Polo Estates, is a small, intimate enclave of large home sites; each approx. 2 acre. It is gated, and the interior streets are maintained by the Residents. Homes are unique and custom to that owner. Homes have been built since the late 1980’s until today! These small “ranchettes” are zoned for 2 horses/acre and appeal to a broad range of equestrian lovers. Jefferson St. is a about 10 minutes South of Hwy 111, the desert’s main connection between the East and West Valley. Cross Hwy 111 and it’s approx. 10 minutes more to the Interstate 10 Fwy entrance. You’ll feel like you’re in the country, but the City is only a short drive away. There are still some home sites available for creating your custom home (and barn if you desire), as well as custom homes for sale. Because the home sites are large, approx. 2 acres each, you can really be creative with your home design, as well as your landscape! Truly a special, small, private, gated, Luxury neighborhood. Interior road fees: Approx. $1300/yr. paid annually by each owner. People that like the custom homes at La Quinta Polo Estates, also tend to like Croquet Court in Indio and Andalusia at Coral Mountain.